"Malwarebytes is a very popular malware removal and prevention tool for your PC." Not everyone out there plays nicely within the computer space. There are those who wish nothing but harm to others' computers. One of the easiest and quickest ways for these individuals to do their dirty work is with malware. Malware is created and embedded in programs for the sole purpose of disabling and crippling computers and computer systems. You can protect yourself from these attacks using Malwarebytes. Malwarebytes is a light and powerful malware removal and prevention tool. You can perform a Quick Scan to brush over your files on your hard drive for malicious programs; however if one instance of malware is found, it is recommended that you go ahead and perform the Full Scan, which scans all drives attached to the CPU including flash drives. Many times malware will be embedded in a program's autorun files. This is harder for typical malware removal programs to hunt down; however with Malwarebytes you can easily do away with any malware stored in autorun files using the Flash Scan feature. This feature is only available to registered users, not on the trial version. Malwarebytes' prevention techniques include blocking potentially malicious websites and performing quick scans after a programs installation among others. 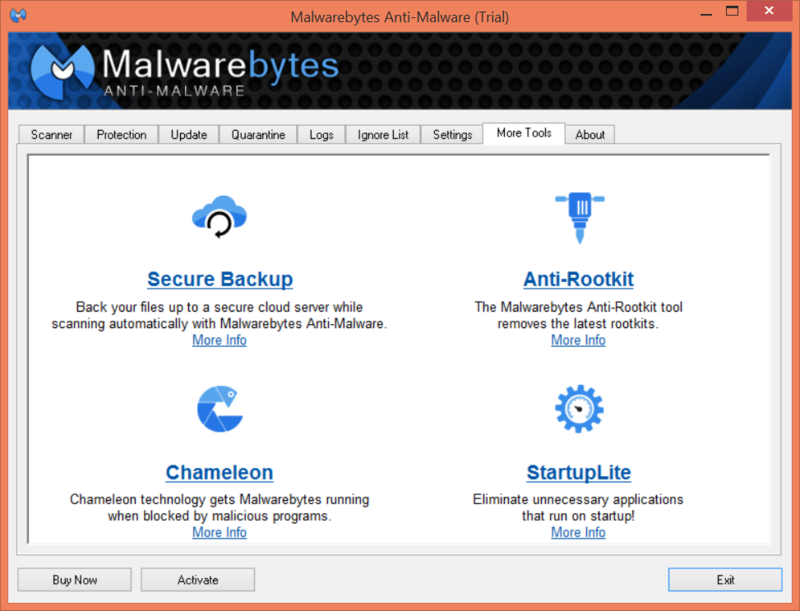 Other tools include Malwarebytes' Chameleon which allows Malwarebytes to conduct its usual activities even after it has been blocked by malware. You can also back up your important files to Malwarebytes' cloud so that your data, if lost on your computer, can be recovered through there server.